We like to hear from ministers up to five years before they retire. We’ll send you an application form and contact you again in the months following to arrange to meet you and discuss how we can best serve you in retirement. ‘Many of us nearing retirement would be very worried if the Housing Society wasn’t there,’ said one resident Revd J Neil Graham. 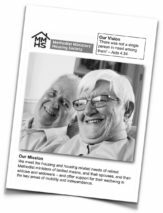 Download the MMHS retirement leaflet.